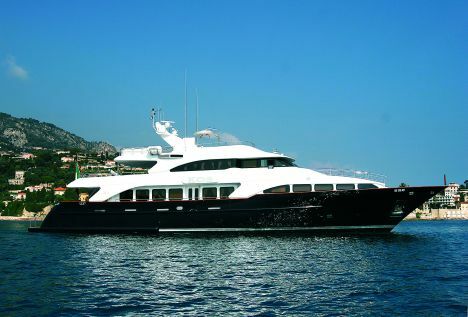 "KOS" is a displacing 36-meter Benetti yacht named after a Greek island near the Turkish coast. She is a megayacht with wooden classical interiors, lighted up by of kilim- styled fabrics with four dominant colors: red, blue, ochre and green. A cozy yacht, where the fabrics used for upholstering beds and armchairs, mixed with leather insets and leather cladded bulkheads, play an important role in the warm atmosphere of the interiors. Interior styling - an extremely successful mixture of quasi-British and quasi- Eastern styles - is by François Zuretti and the stroke of his unwavering hand pleasantly astonishes us once more. Few classy paintings are hanging on the bulkheads. The flooring is in teak; bulkhead cladding is in lacquered cherrywood in daytime areas and in wood with leather insets in the cabins. The bathrooms are in superior marbles, cut and combined so as to create a precious pattern of symmetrical veins. The small bookshelves scattered all over the yacht, the little vanities in the VIP staterooms and the upper deck humanistic office disclose the interest in a secluded, almost domestic type of life, made of several well calibrated passions. Everything reveals the class and self-confidence of the Owner's personality. From the cockpit on the main deck we enter in the saloon and the dining room, these two spaces are separated in quite a classical way by the ladder. To starboard there is the men's club with bar counter, stools and an open bookcase with side glass display cabinets. The cigar-book is beautiful and here again the bar counter's marble is marvelous. To port, there are comfortable sofas, upholstered in beige ribbed knit wool, with red and anthracite gray pillows made with the same type of fabric. The Chesterfield armchairs, around the coffee-table, are in dark brown leather and cream and beige houndstooth. Beyond the ladder there is the dining room, with a nice oval table sitting ten with chairs upholstered in black ribbed knit wool. The galley appears behind the dining room, to port, interrupting the succession of the other spaces. The wooden lining of cabinets and bulkheads contrast with the green of the pantry's small leather sofa and with the worktop's marble. Here technology is marked by Miele household appliances and by the refrigerated Eurocave wine cellar for 120 bottles. 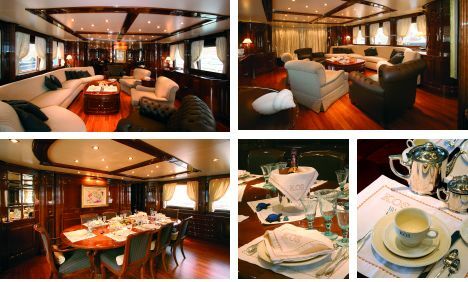 Even the crew quarters, accessed from the galley, have superior and custom finishing with high quality woods and marbles. To starboard, along the bookcase-lined corridor, one reaches the master suite. The prevailing color is navy blue livened up by the red Chesterfield armchairs and the capitonné-styled leather headboard. The en suite bathroom lined in wood includes THG accessories and features an original shower stall with Turkish bath - twice as long as the shower stall and lined with black and gold "Portoro" marble. 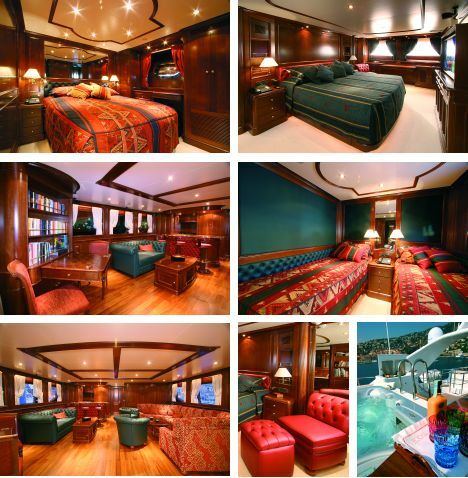 On the lower deck there are two VIP cabins. The portside cabin is mainly ochre with a red headboard and the en suite bathroom marble features combining red streaks. The starboard side cabin, on the contrary, is red with an ochre headboard and the shower stall marble is ochre. The portside twin cabin has ochre bedspreads, red bulkheads and red Chesterfield armchair, while the shower stall is lined with white marble with beige speckles. The starboard side twin cabin, on the contrary, has red bedspreads and green leather lined bulkheads. The shower stall is lined with white marble with red speckles. Among the beautiful details there is the adjustable plasma screen hanging on the right bulkhead above the bed. The TV set here is not an attention- catalyzing totem, rather one of the several pleasant activities one may carry out onboard, in addition to reading or playing. The small vanity, crafted from the low cabinet in the VIP cabins, with opening top is a real treat. Even in the helm station the technical area is refined by the wood and by the sofa's green leather. The upper deck living area is similar to a private club with a large red kilim-styled sofa and a green sofa with two Chesterfield armchairs. On the sides of the glass door there are two corner bookcases, one of them includes a card table that may be concealed when not in use. Going from the helm station to the dining room, we find a nice office full of books and to starboard the pantry with dumb-waiter. Interiors are naturally completed by the sundeck, where one continues to lead the onboard carefree life in direct contact with the sun and the sea. Here, as elsewhere, the generous yacht offers her gifts: a marvelous Jacuzzi "Dallas style" whirlpool, with extensible umbrella-like sunshade, a barbecue, bar area and lastly, the dining room with table and L-shaped settee. Aft, the upper and main deck areas include GRP settees with corduroy cushioning. Interior styling of this brand new yacht astonishes for her confident touch originating in the classical tradition, mainly reassessed through a careful combination of colors and fabrics which enliven and warm up the wooden surfaces. Actually, the range of colors and materials is quite limited but their combination was done with expertise and sobriety. KOS interior styling naturally combines with the Owner's choice for a navy blue hull... but then another story should be written about hulls and concept design.